Great Finale for Heritage! 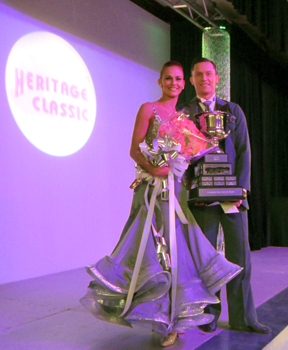 The last night of the Heritage Classic was brilliant closing with a phenomenal show by former world and current Open British Latin Champions Michael Malitowski & Joanna Leunis, who delighted the crowd to a standing ovation at the end of their performance.
" The mirror is not you. The mirror is you looking at yourself"
Michael was very forthcoming and humble when introducing the last number “I’m still standing” (Jive) where he spoke about the ups and downs of competition and the fun and beauty of it from his own experience “Sometimes you win, sometimes you lose” an animated well spoken Michael said to the crowd. This was well received by all competitors from professionals down to the pro/ams who all relate to the ups and downs of competition dancing. “But all is good and part of the experience and with that I dedicate this number to you and to my incredible partner Joanna.” It was magnificent to see Michael be so well spoken with huge professionalism and emotion making us all understand that there is more to learn from dancing and that as hard and as tough as the business can get it is still a wonderful endeavor. The evening competitions began with Pro/Am Ballroom Scholarships, the best for us this time was the “B” division, this started with a semifinal round and at the end Carole Simmons w/Serghei Pogonet from Canada took the overall prize but not every dance. She placed first in three dances and second on the waltz, tango, and quickstep. The recipient of the VW and Foxtrot and second place overall was Brynda Insley w/Martin Reinbold (2,2,1,1,2), Lisa Berry W/ Rauno Ilo took all thirds, Yanina Kisler w/ Peter Walker placed fourth (4,5,5,4,4), Bo Chang W/ Giampiero Giannico was fifth (5,4,4,5,5) and the sixth place went to Siki Kramer w/Gunnar Sverrisson and they placed sixth in every dance. "When you dance, your purpose is not to get to a certain place on the floor, it's to enjoy each step along the way"
The “C” division was awarded to Lynn Murrell w/Alexander Voskalchuk (1,2,1,1,1), Lisa Lowery who with teacher Radek Wiatrowski had been cleaning up first places in all styles had to console themselves with a second placed finish (2,1,2,2,2). Sally Wiese w/Dimitrijus Sanizas took all thirds, Elena Lee w/Emanuele Pappacena took all fourths, Doug Bailey w/Irina Gorshkova was fifth (5,6,6,5,5) and sixth went to Patricia Redies & Richard Tonizzo (6,5,5,6,6). 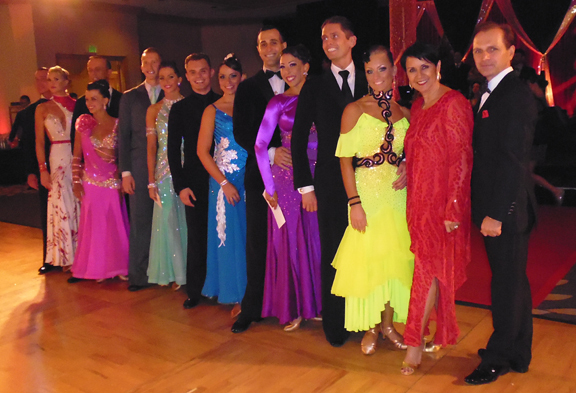 There were only two competitors entered in the “A” division and Levina Kasmara w/Slava Stefanov took all firsts and Beatriz Colon w/Roman Malkhasyan was second. Out of the two professional events run this last evening the Latin had the most punch and had the best reception form the audience. 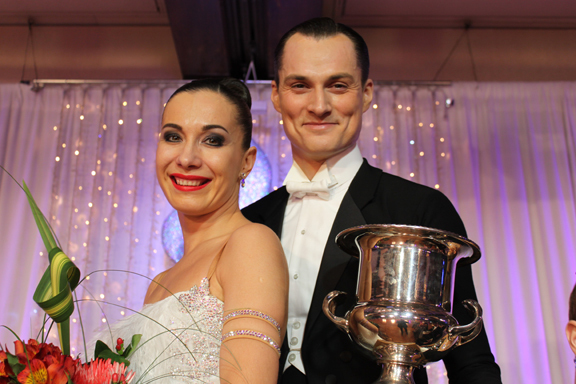 Ivan Mulyavka & Loreta Kriksciukaityte took all firsts in all dances. Dmitry Nikishkin & Olena Shvets all seconds and all thirds went to Sergiy Samchynskyy & Yuliya Besarab. Felipe Gonzales & Kathleen Ilo were fourth (5,4,4,5,4), Hayk Balasanyan & Emilia Poghosyan placed fifth (5,4,4,5,4), and Jake Davies & Alyona Kalinina took all sixths. The Professional Smooth, for us, had the same amount of entries but less of a punch. Here Kostadin Bidjourov & Erin Marie were first in all dances, Vladimir & Vera Kosarev took all seconds. From here down it all was a bit different Mark Short & Alyssa Kark placed third (3,5,3,3), Dennis Woods & Amber Reich were fourth (4,4,4,5), fifth place went to Andrei & Elena Rudenco, and last but not least in sixth place were Dustin Hall & Angela Oh Park and here they took sixth in all dances. "Opportunity dances with those already on the dance floor." The evening went quite fast for us and that we think it is a good sign. We want to once again congratulate Colin & Joy Hilary for another excellent job in this 2014 Heritage Classic, as I said before this land in the sky is perhaps not the easiest place to get to but the competition is sure worth the drive or the fly to get there. It always delivers a sense of relaxation with the thrill of competition like Mr. Malitowski said during the show, we hope to be able to come and enjoy many more in future years. Like a Box of Chocolates! Competition ballroom dancing is just “like a box of chocolates” you never know what you are going to get. And this was perfectly proven last night in the results of the Professional Rhythm, Ballroom and Theater Arts/Cabaret. 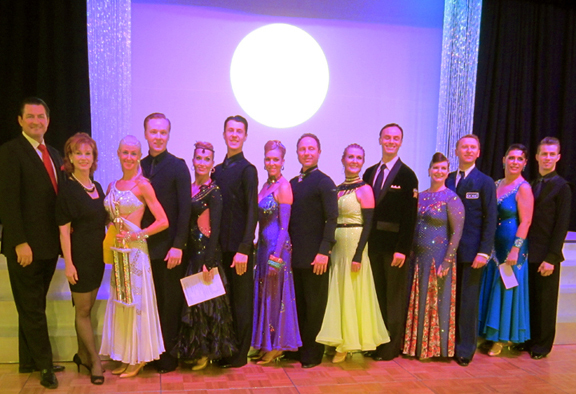 As we posted on our bulletin board last night the biggest surprise came in the Rhythm wherein what must have been a very interesting and appealing performance for the judges, Erwin & Iwona Rybczynski overtook everyone and won overall by placing second in cha and swing and winning the remaining 3 dances. Second on this heat went to Max Lototskyy & Sarah Haworth a relatively new partnership that has been winning most Rising Star and Open that I have attended lately, but last night the judges were not sure what to do with them, take a look at their scores (1,2,3,2,5). Third went to perhaps the very favorite to win Vard Margaryan & Sofya Fill (3,4,1,3,4) who I’ve seen in a number of times overtake well-placed and top of the line finalist. But here studying the scoring sheets after the competition was as interesting as the competition itself, in short words the judges marks were all over the place. 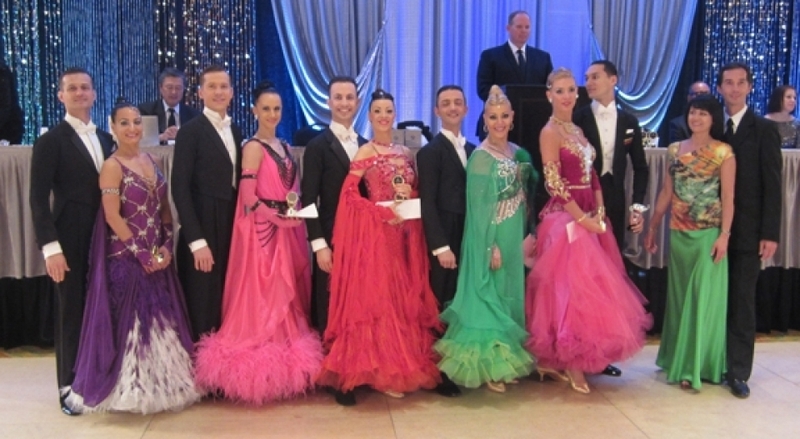 Fourth in this interesting 7 couple Rhythm final wen to Matthew Hauer & Lauren Schelfhaudt (4,3,4,4,2), fifth was awarded to Romney Reyes & Brook O’Donnel (5,5,5,5,3), Sandor Stefil & Aleksandra Barsukov placed sixth (6,6,6,6,6), and Michael Focannon & Meghan McNash took all sevenths. For the couple that came to our music stand to tell me that perhaps the authentic mambo we played was basically out of time (Cali Pachangero), when dealing with authentic music I advise couples not to rush when you hear the first beat, this is not a timed race where you win if you get there first. I really did not notice them off time but maybe the judges did because you got very low scores on that dance. Moral of the story, pay close attention and listen before you start, if you are having issues finding the beat, let your lady partner lead, I always did. In a separate note Peter and Alexandra Perzhu were scheduled to dance but withdrew in last minute. :( sad for us! Artem Plakhotnyi & Inna Berlizyeva won the Professional Ballroom over Alexander Voskalchuk & Veronika Egorova in the Professional Ballroom. Artem & Ina’s scores were (1,1,2,2,1), Alexander & Veronika’s scores were (2,2,1,1,2). The most interesting and almost shocking for us while reading the marks was that a few of the judges awarded Alexander & Veronika 6th and even 5th place marks, I wonder if we were all looking at the same event, or were they not wearing their glasses?? 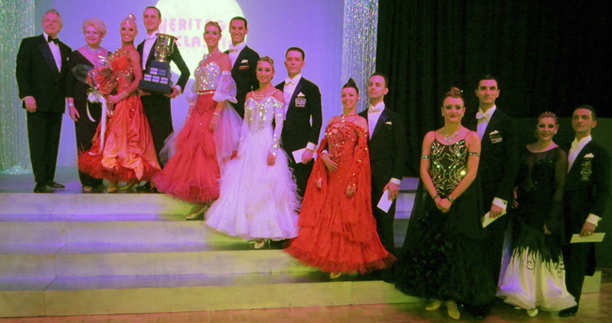 :) Third in this excellent final was Egor Abashkin & Katia Kanevskaya and they placed third in every dance. Gianni Caliandro & Arianna Esposito placed fourth (4,4,4,4,5), fifth was awarded to Richard Tonizzo & Clair Hansen (5,6,5,5,6), and last in sixth place was Emanuele & Francesca Pappacena (6,5,6,6,4). It was also refreshing to have an excellent west cost swing couple be rewarded for their unique elements and the perfect execution of their routine in the Pro Theater Arts/Cabaret Championship. The standard in our ballroom field is to award what we are comfortable with and that is Ballroom or Cabaret, over dances like west coast or merengue that are out of the ordinary. Here the judges broke from the usual and gave James Brann & Sayra Vazques their first place marks, second went to Ivan Mulyavka & Loreta Kriksciukaityte and third was awarded to Jake Davis & Alyona Kalinina from England. 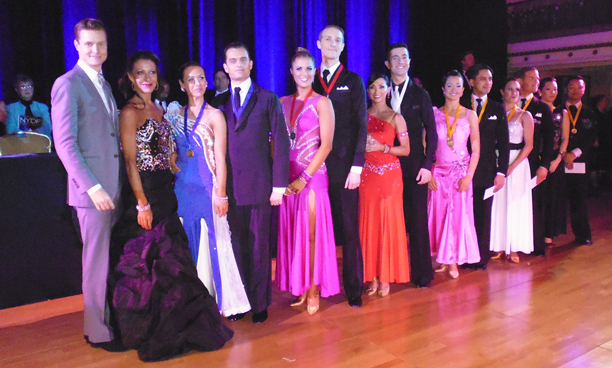 The pro/am Latin Scholarships were fun but very small with most of them having only 5 couples or less, even the “C” division that up to now has been packed in the other styles, here only had 4 couples. The winner of this was none other than Lisa Lowery w/ Radek Wiatrowski. They won all dances but the Jive, here they placed second. 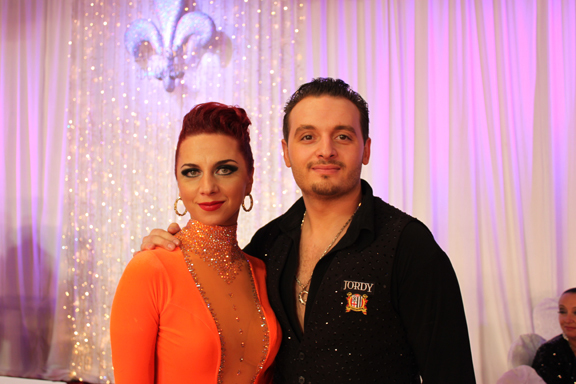 Marguerite Pinard w/Nerijus Jasaitis took that jive and placed second on all the other four dances. Nora Fox w/Plamen Danailov was third and fourth went to Lisa McKee w/Clement Joly. 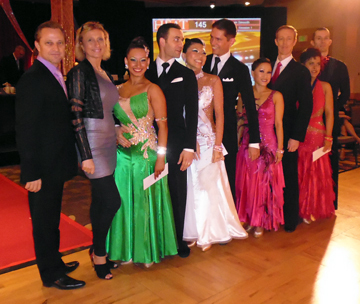 4 couples also took to the floor for the “B” division of the Pro/am Latin. Here Valeria Chayko w/Stanislav Kochergin won all dances. Letizia DiCarlo w/Mario Droby placed second (2,2,4,2,2), Melanie Gold w/Dandor Stefill were third (3,3T,3,3,3), and in fourth position was Kathy McDonough w/Felipe Gonzales (4,3T,2,4,4,). The Smallest of the Pro/Am Latin scholarships was the “A” here only 3 couples competed but it was certainly worth a mention, all ladies competing were terrific. Dasha Hamrick w/Clement Joly won all dances and we must point out that Dasha also won the 10-dance Scholarship and the Youth event run earlier in the evening. Sabrina Strasser w/Stanislav Kochergin from Canada took all seconds and third position wen to Beatriz Colon w/Roman Malkhasyan. Besides the unpredictable marks the dancing was all worth the ticket. The Professional Ballroom was fabulous with plenty of moments to make your breath pause, the Rhythm was a little even between the couples but they were all excellent and of good caliber not one finalist was out of place. Congratulations to the organizers on a wonderful night of excellent dancing. A Smooth Day and Fun Night at Heritage! It was a fun and Smooth day yesterday here at the Heritage Classic. The Smooth scholarships were excellent. So far, for us, the “C” divisions have out done themselves and yesterday was no different. As in the night before Lisa Lowery w/ Radek Wiatrowski won the “C” division, with challenge form Lynn Murrell w/Peter Perzhu who placed second. Hope Huber w/Troy Baeten were third (3,3,4,4), Gracelyn Tuoti w/Andrei Abrashin took fourth (6,6,3,3), Susan Haynes w/Slava Stefanov were fifth (5,4,5,5) and Carolyn Woodruff w/Alosha Anatoliy placed sixth (4,5,6,6). In the Smooth “B” division Lisa Berry w/Rauno Ilo took the prize home, second was Christina Donelson w/Peter Perzhu and third was Darla Davies w/Jim Maranto. Diana Best w/Alosha Anatoliy placed fourth, Elain Whitford W/Yuriy Simakov were fifth and Dana Sampaleanu w/Aleks Nashev took sixth. The “A” division was the smallest in entry but not in talent and here Maria Papakonstantinou w/ John King took first, Anna Ord w/Prageeth Hettiarachchi took second (2,2,2,4), Ekaterina Galperina w/Rex jones was third (3,3,3,2), and Rachel Peppard w/Darian Chancellor placed fourth (4,4,4,3). 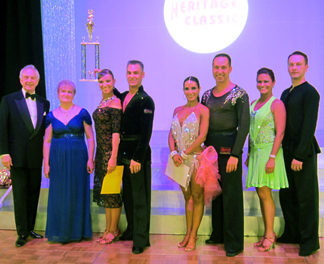 In the 9 Dance Maria Papakonstantinou w/John King won all dances and took the trophy home, Darla Davies w/Jim Maranta placed se cond in all dances but the VW where she took third and third place was awarded to Shari Oxman w/Roman Malkhasyan. 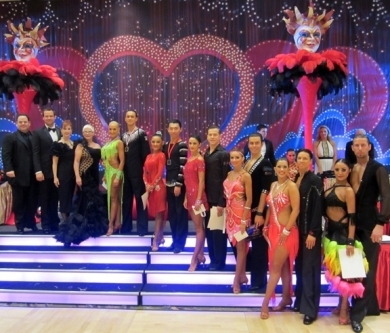 Three professional divisions were decided this night as well and the RS Professional Latin went to Jake Davis & Alyona Kalinina from England who placed first in all dances but the samba, here they took second. 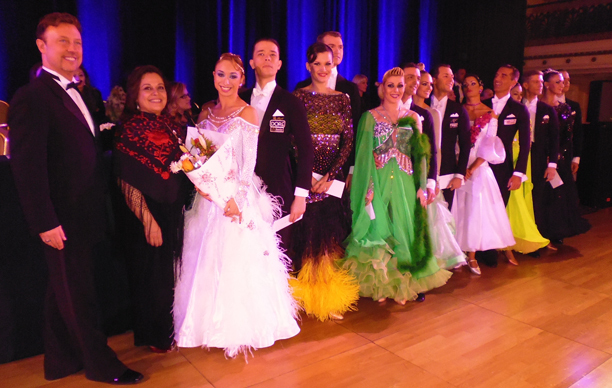 The first place in the samba went to Felipe Gonzalez & Kathleen Ilo who were second in all the other four dances, third wen to Kirill Nikitin & Jenya Kanchukova. There was a seven couple final in the RS Professional Ballroom and Smooth. 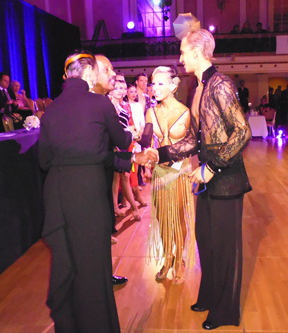 The Ballroom Rising Star belonged to Oscar Pedrinelli & Lenka Kovalcikova who placed first in all five dances. Second in all dances wen to Mechyslav Pavlyuk & Gemma Arnold, and third was awarded to Oleksiy Buravenko & Victoria Karzukhina (4,3,3,3,3). 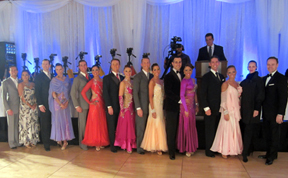 The Professional Smooth was awarded to Adrian & Hannah Dydynski and they too won all dances, second went to Andrei & Elena Rudenco and third in all dances was awarded to Dennis Woods & Amber Reich. I must congratulate the organizers, Colin & Joy Hilary for their organization skills, everything is like clockwork. And on a personal note, I cannot, have enough of this wonderful resort in the Blue Ridge Mountains of North Carolina, the days have been so beautiful I can almost spend all day staring at the picturesque view just outside my window and the grand balcony just outside the main lobby. 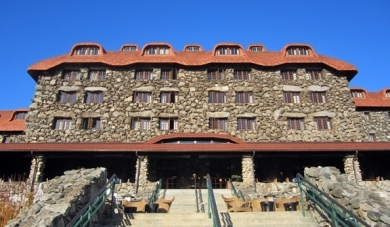 For those of you that are missing it this year for whatever reason, the hotel has b een given a facelift. There is the old main bar in the lobby and a new one by the restaurant. The registration desk has been removed and it is a welcome site, the lobby is grand and more spacious with its two gigantic fireplaces alight at once. Anyone that knows me, knows that I’m not one to be attached to the old, but this grand hotel is a very special place and I am glad that it has become a tradition within our ballroom community. I know for many of us is a bit of a hustle getting here but it sure is worth your while, a perfect human nest within “the land of the sky,” Asheville. Great “C” at the Heritage Classic! Last night’s feature events were the Pro/Am Smooth Scholarships and the Professional Rhythm. Of all of them, our favorite was the Pro/Am “C” category where three excellent ladies fought hard for the honor of being number one. 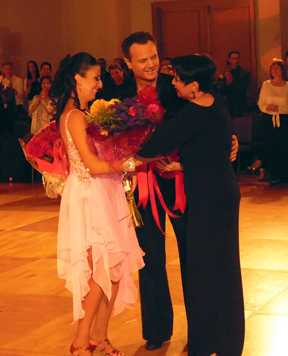 "There are shortcuts to happiness, and dancing is one of them"
The first place honor went to Lisa Lowery with professional, Radek Wiatrowski who kept her composure and did what she had to do with out ever being of the age, they won all dances. Quin Bommelje w/Mikhail Vlasov placed second but as you can see by the marks it was not an easy second to have - 4,3,2,2,2. Third in this mix was another terrific player and this was Lynn Murrell w/Peter Perzhu (2,2,3,3,4), fourth went to Gracelyn Tuoti w/Andrei Abrashin (5,5,4,4,3), fifth was awarded to Darla Davies w/Jim Maranto (3,4,5,5,5) and last but not least in sixth place was Michelle Kirby w/John Moldthan. "Eat, sleep, breath...Dance" The competitions were excellent but with this lovely weather there was plenty to do outside. I went for a walk and I saw plenty of people exploring the resort. The welcome cocktail party overlooking the Blue Ridge Mountains was beautiful and fun. But lets not forget why we are here, there were other competitions that were as challenging as the Smooth Pro/Am C Division and are worth a mention. The “B” Pro/Am Smooth was also excellent but with less couples entered, only four couples took to the floor for this final and Caci Torres w/Eddie Rivera won this challenge (2,1,1,2,1), Second in this B category was Mieko Okumura w/Zeki Mavilyildiz (1,2,2,1,2), third went to Diana Best w/Alosha Anatolly, and fourth was awarded to Annick Desjardins w/Yuriy Simakov. "Dance first. Think Later. It's the natural order"
The “A” division was also interesting and here we had an 8-couple semifinal and once in the final the winner of this by far was Maria Papakonstantinou w/John King. Second in this A division was Jessica Sweeney w/Jeremy Pilling , third went to Lauren Watkins w/Michael Neal. Fourth in this same A event was awarded to Jacey Warren w/Joe joe Hasson (5,4,4,4,6) and fifth was awarded to Anna Ord w/ Prageeth Helttiarachchi (4,5,5,5T,5), leaving sixth to Ekaterina Galperina w/Rex Jones (6,6,6,5T,4). The Professional Rising Star Rhythm was also another feature event of this night but unlike some of the Pro/am events it did not have a punch. The couples were all of an excellent level and perhaps that was the problem each one of them could have some kind of claim to top place. 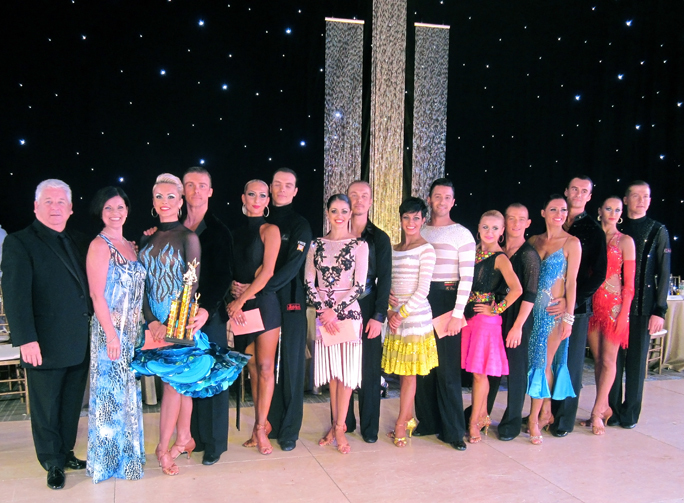 The new partnership of Max Lototskyy & Sarah Haworth won all dances, Erwin & Iwona Rybczynki took second. Romney Reyes & Brook O’Donnell placed third (3,4,3,3,3), Kurt Roberts & Anneliece Velasco placed fourth (4,3,4,4,4), Sandor Stefil & Aleksandra Barsukov were fifth and Timothy Polaschev & Katherine Hutchinson took all sixth. "Dance is music made visible"
The Duke Comes to NYDF Well! His orchestra anyway! 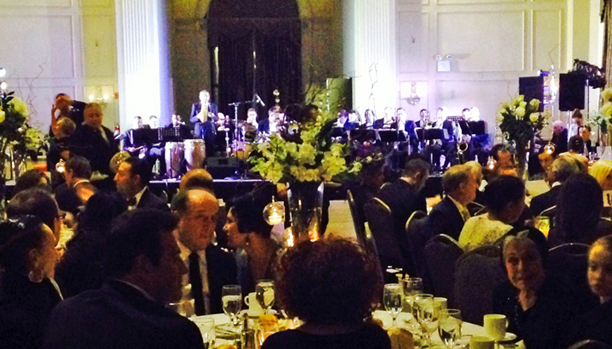 Last night between 6 and 8 PM the Duke Ellingnton Orchestra played for a splendid TAP (The Alzheimers Project) benefit dinner and silent auction in a second beautiful ballroom of the Roosevelt Hotel. 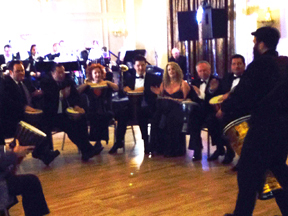 It was a fabulous affair with a banquet dinner and entertainment. The judges were one of the attractions as they were all given drums to show how drumming is used to treat Alzheimer’s patients. Eddie Torres and his son also performed an “old-style” salsa to the live music (which they reprised later the same night at the competition). "The only way to make sense out of change is to plunge into it, move with it, and join the dance" But back to the competition – last night it was the turn of the Smooth and Latin professionals. We thought the Smooth offered the most entertainment with a full semifinal to start. 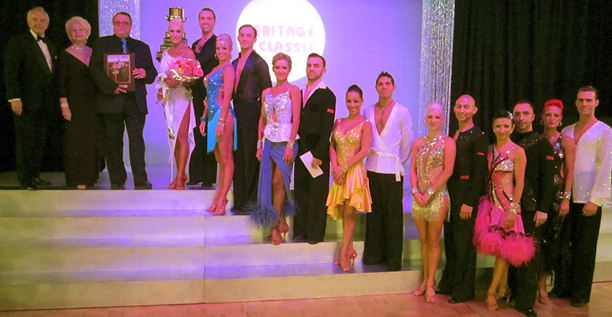 Travis & Jaimee Tuft won all dances but it was a tough fight with runners-up, Nick Cheremukhin & Viktorija. The Tufts took the waltz by 8 first places to 7, the tango by 8 to 6, the foxtrot was a 7 to 7 tie and the Viennese again by 8 to 7. An excellent duel indeed! Sergey Barsukov & Maria Sidnjova took all the 3rds, Michael Koptke & Chelsea Farrah were 4th (5,5,4,4); Morten Jensen and Tonja Martin took 5th (4,4,5,5) and Serge & Yana Nelyubov were 6th. Dmitry Nikishkin & Olena Shvets had an easier time in the Latin, which was a 7-couple final, taking all dances with a large majority of 1st places. 2nd in all went to Hayk Balasanyan & Emila Poghosyan and 3rd in all to Riccardo Papi & Sabina Moretti. Dmytry & Nina Vovalnko were 4th in all dances. These 4 were well clear we thought. 5th went to Srdjan Mikuljian & Carolina Avila 5,5,5,5,6; 6th to Jungie Xamora & Sheena Daminar 7,6,7,6,5; 7th to Anton Grigoryev & Yuliya Guseva 6,7,6,7,7. 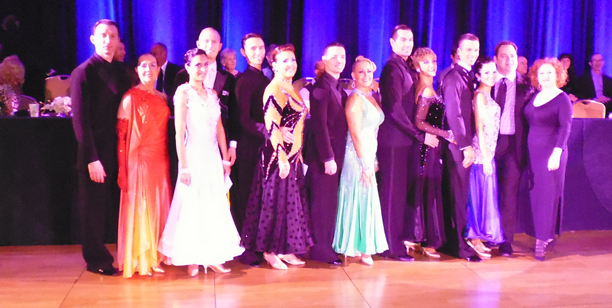 We felt the Amateur Latin was a close race between the 1st 2 couples, but the winners did take all dances. They were Vladislav Kvartin & Amanda Herrschaft. Taking all the 2nds were Jason Dai & Anna Tabolina, a new partnership we believe. 3rd place went to Adria Barinaga & Edyta Kwasna (4,3,3,3,3); 4th to Malachi Osai & Annabella Waszkiewicz (3,4,4,4,4); 5th Ivan Angelovskiy & Teresa Garcia (5,5,5,5,7); 6th Filipp Akopyan & Uliana Shunevich (6,7,6,6,5); 7th Guy Platt & Freda Chen (7,6,7,7,6). "Work like you don't need the money. Love like yu've never been hurt. Dance like nobody's watching" In the Amateur Smooth an anonymous sponsor offered to pay the way of the top 2 couples to the NDCA Amateur Championships in Provo. Mayo Alanen & Michelle Officer, who also sponsored the Pro Smooth, increased that to include the 3rd couple. The lucky three were winners Paul Ferris & Kelly Glasheen, 2nd placed Jason Seabury & Nonie Shiverick and 3rd placed Zachary Lapidus & Emi Terasawa. 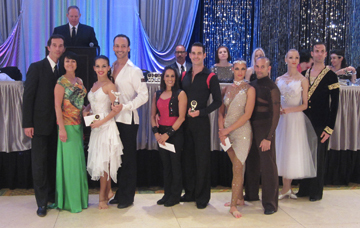 The pro-ams danced Smooth all day and the Open Scholarship was won by Melissa DiPietro w/ Randy Dias (1,2,1,1). Janice Stanton w/ Clive Phillips was 2nd (2,1,3,3) and Renee Kuwahara w/ Ilya Reyzin took 3rd (3,3,2,4). 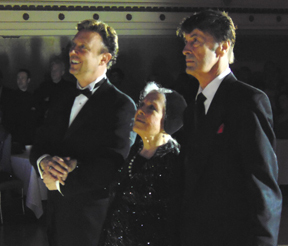 Hollywood screen star Marge Champion was in the audience and Edward Simon presented her with a special achievement award after Gary Pierce had introduced her and we all saw two of her famous dance routines with husband Gower. Edward also awarded an “Unsung Hero” award to scrutineer extraordinaire, Marie Fantini. Last night at the New York Dance Festival there were two foundations that benefited from some exposure. One of them was Ballroom Barks a foundation set up to rescue abused and abandoned dogs. It was a dance competition but all done with humor and theme most of the participants wore dog costumes and even the judges got into the act by barking up a storm. Yvonne Marceau, cabaret great from yesteryear was also in the house to introduce some children from the Dancing Classrooms project that has introduced ballroom dancing to state schools nationwide. "Life is the dancer and you are the dance." But the main features were the Professional Ballroom, Professional Rhythm and Cabaret gaving the New York, dance-savvy audience something to enjoy. All three events were excellent, filled with great talent and major expectations. The Professional Ballroom had a brilliant final with many of the couples fighting for first place. Unfortunately only one couple could take the top spot and that was Egor Abashkin & Katia Kanevskaya who overall won all dances. 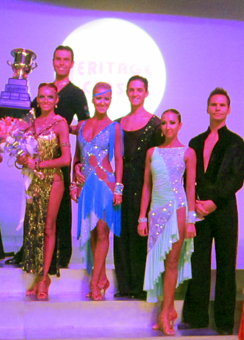 Igor Mikushov & Ekaterina Romashikina placed second in all dances and Emanuele & Francesca Pappacena took the thirds. From here on it was very evenly contested. Oscar Pedrinelli & Lenka Kovalcikova were fourth but as you will read did not take all the fourths (5,4,5,4,4) and Samuel Pacchini with his new partner Anna Oblakova were fifth (4,5,4,5,5). This new young lady was the talk of many in the audience who were thrilled with her responsive and pliable performance. Nazar Batih & Mariko Cantley were sixth (7,7,6,6,6) and Ruslan & Katusha Wilder placed seventh (6,6,7,7,7). The Rhythm category was heated up the duel for supremacy in this field between US heirs-apparent, Emmanuel Pierre Antoine & Liana Churilova and Nazar Norov & Irina Kudryashova. 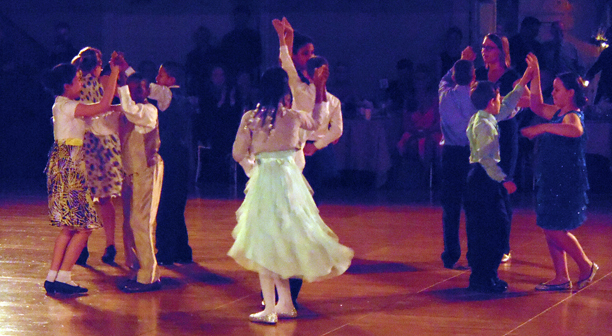 On paper Emmanuel & Liana won the event with huge majorities of firsts in many of their dances. However, when you spoke to the educated audience present, many would have been equally happy to see Nazar & Irina in that top spot. The fantastic thrill for us is that this category has now more excitement that we have seen in the past 6 years and it is great for the fans and even for us who are used to the game. Moving up the tree to 3rd were Vard Margaryan & Sofya Fil, 3,3,5,3,3. This put them ahead of Azamat Evgamukov & Kateryna Angelone 4,4,3,4,4. Strangely Azamat & Kateryna had more "3rd or better" scores than Vard & Sofya but often 1 short of the majority of 9 needed for 3rd place. Shane & Shannon Jensen were 5th 5,5,4,5,5 and Matt Hauer & Lauren Schelfhaudt were 6th. The Cabaret ended with a prolonged standing ovation for the winners, Shane & Shannon Jensen who received 14 of the 15 first places from the judges. We have seen them perform this routine a little better as Shane almost tripped at one point, but it still a very impressive number. 2nd were Travis & Jaimee Tuft who also get stronger and stronger in this style. 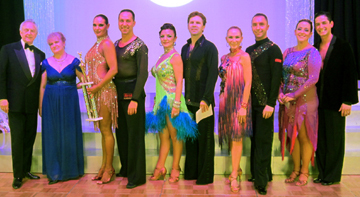 3rd spot, performing a Latin showdance, were Hayk Balasanyan & Emila Poghosyan; 4th Vincent Antonelli & Stephanie Falciano and 5th Igor Gayenko & Sarika Hudson. 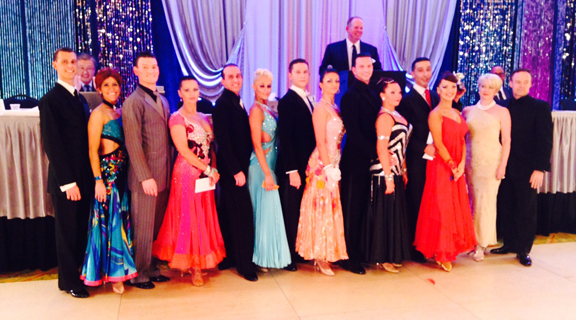 The Amateur Ballroom was a straight 5-couple final and the easy winners wereYuriy Nartov & Yuliya Blagova. They took most of the judges’ first places and won all dances. The remaining couples shared the judges’ score without much consensus. Taking 2nd were Samuel Hacke & Katarina Hermanova 2,3,2,2,2. 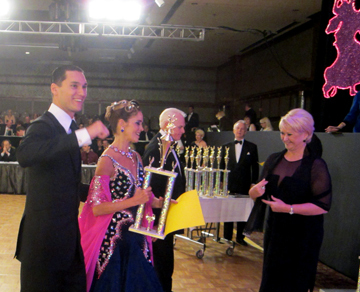 Samuel & Katarina also won the Youth Ballroom earlier in the evening. 3rd were Justin Lin & Sasha Dubinsky 3,2,3,3,3; 4th, Alec Zhiwei-Zhang & Klaudia Khuzinski and 5th Cezary Dryda & Jennifer Chin. For the pro-ams is was a full day of Rhythm heats. The well-contested open scholarship began with a 16-couple semifinal. The winners, in all dances, were Elena Cormio w/ Edwin Torres. Taking 2nd was Phillip Widlanski w/ Jolanta Mosteika (2,2,2,2,3) and 3rd was Renee Kuwahara w/ Ilya Reyzin (3,3,4,3,2). Having A Ball in NY – F Eddie Simon’s New York Festival is ongoing in the heart of Manhattan, NY, at the historic Roosevelt Hotel, near Grand Central Terminal (not Station). Even the weather warmed up! The first day of competition was about international style in the pro-am divisions. Both styles took place yesterday. Both Open Scholarships gave us some good competition. In the evening it was Rising Star night with all 4 divisions showing last night. This resulted in 3 straight finals with a semifinal in the Smooth. Kyle & Allie Spinder (CA) were the sinners of this Smooth division. They won all dances, but waltz and Viennese Waltz were close with the runners-up, Sergey Barsukov & Maria Sidnjova (FL) who were 2nd in all dances. 3rd in all were Serge & Yana Nelyubov (NY). In the Rhythm we saw a reversal of form from 2 weeks ago in Maryland. 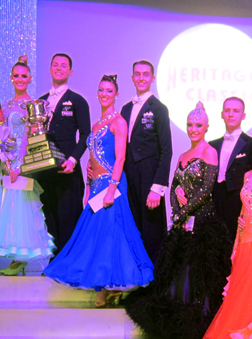 This time Shane & Shannon Jensen (CT) were the winners over Andrey Svirydzenka & Yuliya Zubova (NY). Shane & Shannon won all dances. 3rd tonight were Romney Reyed & Brooke O’Donnell (FL) 3,3,4,3,4. Riccardo Pappi & Sabrina Moretti were the winners in the RS Latin, taking all dances with the majority of 1st places in all dances. Dmytry & Nina Kovalenko were 2nd in all. After that it was much more mixed, but taking 3rd were Srdjan Mikuljan & Carolina Avila 5,4,3,4,3. 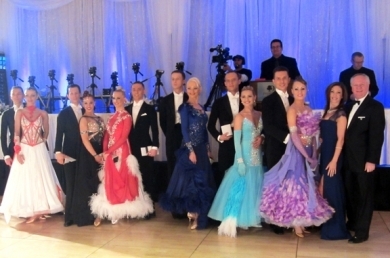 The smallest of the divisions was the Ballroom with only 4 entrants. 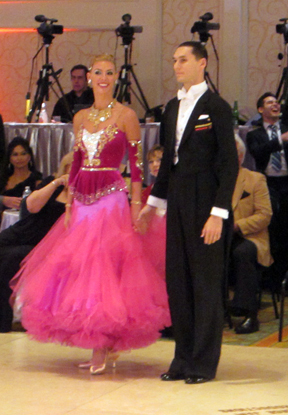 Oscar Pedrinelli & Lenka Kovalcikova (NY) won all dances. 2nd were Igor Gayenko & Sarika Hudson (NY) 3,2,2,2,3 and 3rd were Anton Domansky & Anna Chaldysheva (NY) 2,3,3,3,2. We thought the best pro-am divisions of the day was the Open Latin Schoarship. The judges were VERY divided on their scores but the winner was Maria Ceva w/ Lyubomir Arsenov 1,1,1,1,2. 2nd went to Meg Nakamura w/ Nikolai Shpakov 2,2,2,2,1 and 3rd was Khuong Pham w/ Jessie Mineau 3,4,3,3,3. 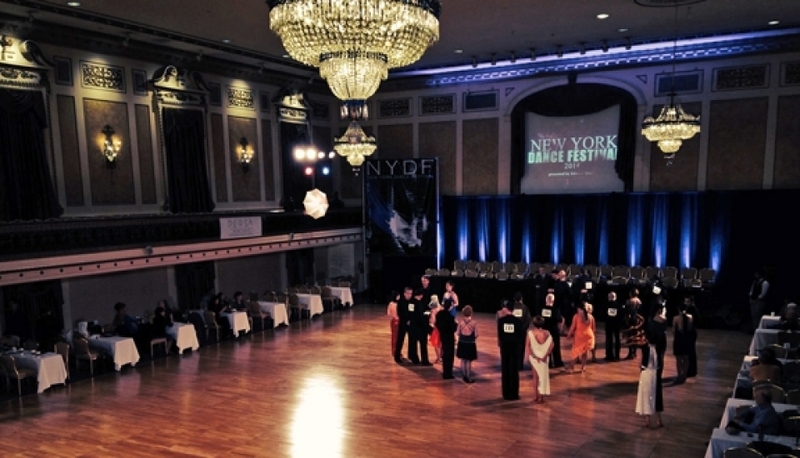 In the Ballroom Open Scholarship Celia Chou w/ Erminio Stefano was the winner. She placed 2,2,1,2,2. Celia had the majority of 1st place marks in the 4 dances she won, including a perfect 7 1st places in quickstep. 2nd, but winning the VW was Brinda Insley w/ Martin Reinbold 3,2,1,2,2 and 3rd was Carrie Steinmetz w/ Ruslan Wilder 2,3,3,4,4. Snowed out! But electrifying finish for Superstars! The last night at the Superstars Championships was terrific with great dancing. 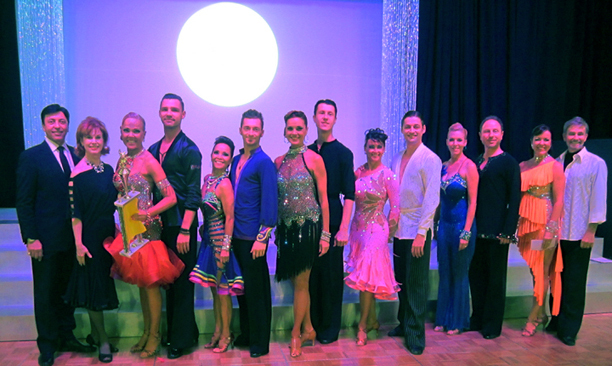 The Professional Latin was run and the winners, Ivan Mulyavka & Loreta Krisciukaityte, won all dances but the cha cha. The cha cha was taken by China’s Ray Zhang & Rosa Ren who were very clean in their approach. The Professional Smooth was also a great event with excellent couples, but here, Peter & Alexandra Perzhu took all dances and in our eyes were the best of the group. The Showdance and Cabaret was also a fierce event. Five couples took to the floor but here the honor of being the best went to Shane & Shannon Jensen who took all first places but one from the judging panel. "We dance around in a ring and suppose, but the secret sits in the middle and knows"
As you can see, the competition was excellent throughout the night but the closing event the “Anything Goes Showdown” was excellent showcasing all the champions from the Open Professional competition throughout the weekend of dance. And in a rare occurrence there was an unbreakable tie between Shane & Shannon from the Cabaret and the winners of the Open professional Rhythm Emanule Pierre-Antoine & Liana Churilova. The third place honor, in this case there was no second place, went to Ivan & Loreta the Open Latin champoions. 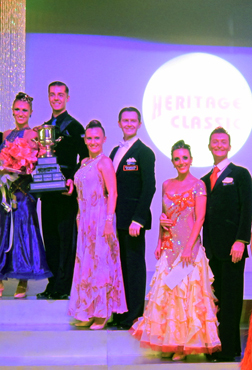 Fourth was awarded to the Smooth Champions, Peter & Alexandra and fifth went to the Open Professional Ballroom Champions, Alexander Voskalchuk & Veronika Egorova. "Kids: they dance before they learn there is anything than isn't music." As always and as you can see by some of the pictures, the ballroom was decorated beautifully in the style of Mr. Chapman, the leading force at the Superstars. It was unfortunate that over 1000 entries had to be scratched or withdrawn due to the snowstorm that swept across the northeast before and during the Superstars. However, the organizers spared no expense to make you feel at home and to make sure that everyone was entertained. It was also great luck that Delyan Terziev & Boriana Delcheva, the featured act at this year’s Superstars, managed to catch one of the last flights out of New York and gave us two wonderful shows, Friday & Saturday. "Opportunity dances with those already on the dance floor" New Partnership Takes RS Rhythm at Superstars The new partnership of Maksym Lototsky & Sarah Hayworth were the clear winners of the RS Rhythm. From the semi into the final, they showed a great sense of musicality and awareness for each other and went on to win all dances. The competition was a little tougher between 2nd and 3rd place. Shane & Shannon Jensen came in 2nd (4,2,2,2,3) over Stephen Smyth & Victoryia Kleyman (3,3,3,4,4). In our opinion, Victoriya had an overall stronger presence and that might have swayed some marks in favor of that couple. Only 1 point made the difference between 3rd and 4th place, Tamas Kardos & Mariya-Khristina Shurupova made their impact by taking 2nd position in CC and Mambo making this a very exciting final to watch. The RS Ballroom had 2 couples enterered. 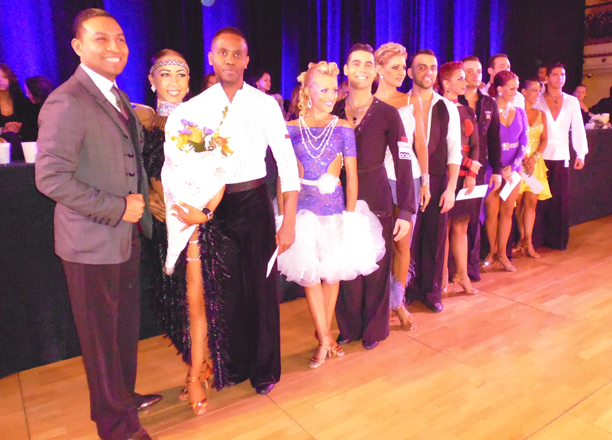 The winners in all dances were Oscar Pedrinelli & Lenka Kovalcikova over Matt Rivers & Maliwan Diemer. It might be freezing outside but sure enough it is hot inside the ballroom! That's the way that La Classique Du Quebec deals with the weather in Montreal. And of course I wasn't only talking about the temperature. The energy that people create and the atmosphere that is beautifully set in the ballroom with plenty of light and great sound spiked with colorful flowers is a signature for what Meryem Pearson and Daniel Heroux put on for this event. "Wives are people who feel they don't dance enough" It started the weekend with the Pro-Am Smooth division followed with some great amateur dancing. While most competitions hold to the very end to have a show by some of the best couples in the world, here they start out with a big bang. The evening session featured a five-dance show by Sergey Surkov and Melia. I've been at this comp a few times. This time it is very visible to me that pro-am dancing is growing in Canada. Friday was the Rhythm division for them. 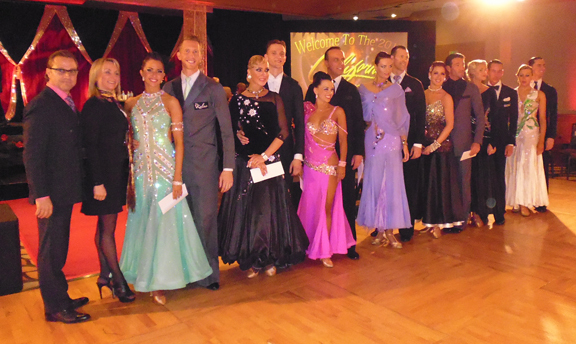 The evening featured the Amateur Latin Championship that started out with 27 couples. There were no surprises in the results. The judges were clearly agreeing on the marks. Now you know why I said that the judges agreed on the marks. Will be back with more info and results soon. 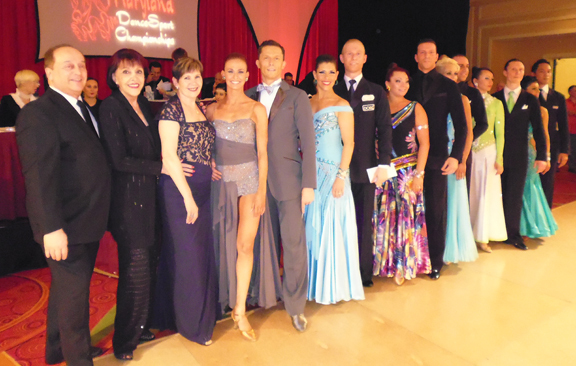 Ballroom Outshines Rhythm at CA Open Saturday The Open Pro Ballroom was the much stronger of the 2 pro divisions last night at CA Open. "There are shortcuts to happiness, and dancing is one of them"
In the final, it was a two-way race for 1st between two of the nation’s best, Artem Palkhotnyi & Inna Berlizyeva and Mikhail Avdeev & Olga Blinova. Today the race was more one-sided than it has been in the past and Artem & Inna won all dances, each with the majority of 1st places. The closest was the waltz that they won by 9 firsts to 6. No other couple took any first places except the top 2. So were Artem & Inna really in tip top form or was it Mikhail & Olga who were not at their best? You’ll have to wait for the full coverage in print or online to get our opinion. 3rd today went to Denis Kutepov & Lesya Sinitsa and we thought they also had a very strong showing. They were 3rd in all dances. We were also impressed with the style and fluidity of 4th placed Igor Colac & Roxanne Milotti and they were 4th in all dances. Taking all the 5’s were Robert Nemiro & Olga Tsikalyuk and 6th in this strong final went to Michael Towliszew & Tiffany Fung. The Rhythm did not rise to the challenge. We enjoyed the performance of Ivan Dishliev & Marieta Nedyalkova who won all dances, but felt they were strongly challenged by the runners-up, Jonathan Chen & Nadine Messenger. 3rd were Dustin Donelan & Kristen McCloskey, 4th Pierro Della Santini & Allesandra Gonzalez, 5th Tommy Belmontez & Jessica Holty and 6th C.J & Jenny Lynn Gomez. Giocomo Steccaglia & Melissa Dexter will offer their comments in Dance Beat soon. Just before the Rhythm division began it was time to say a fond farewell to the much loved team of Jason & Sveta Daly, former US Pro Rhythm Finalists who chose to make their retirement official in front of their home crowd here at the California Open. They danced a beautiful bolero and thanked their many friends and supporters. (The full letter will appear in Dance Beat soon). "Never give a sword to a man who can't dance." The evening began with 3 rounds of the Amateur Latin, with some skillful couples and others who had much enthusiasm but little experience. 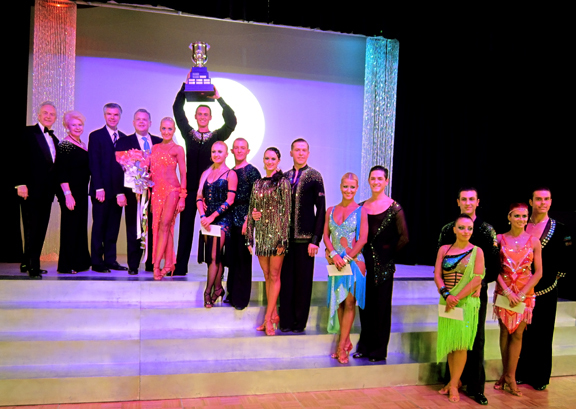 The winners won all dances and they were Denys Samson & Yuliya Nikitebko representing England. They are tall and elegant and certainly were the most eye-catching couple in the competition. We were particularly impressed with the runners-up, Phillip Kudryatsev & Ashley Goldman who have improved tremendously since their move to California. 3rd tonight were Trey & Hope Jackson who are technically strong but lack characterization at this point. 4th fell to Umar Diallo & Natalya Devitskaya, 5th to Teleryck Ianakiev & Natella Devitskaya and 6th to Parker Lynn & Kristina Tieken. For the pro-ams it was Latin day ans we felt these were the strongest of the open scholarships. The A was an especially strong final. Cheyenne Murillo w/ Sasha Althukov won all dances and was clearly ahead in our view. 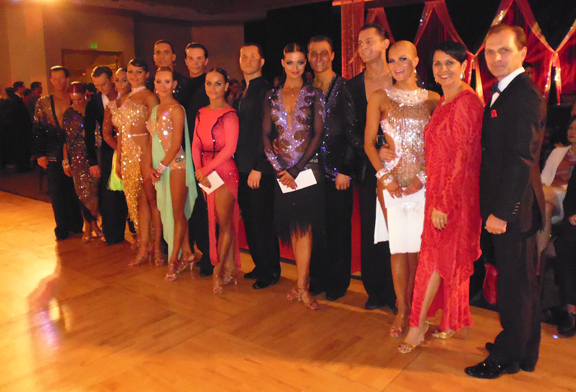 2nd in all was Brittni Gonzalez w/ Radomir Pashev and 3rd was Natalia Zhukova w/ Kiril Nitkin from Russia. Look for a full report on this division in Dance Beat – with perhaps some views that differed from the final results. 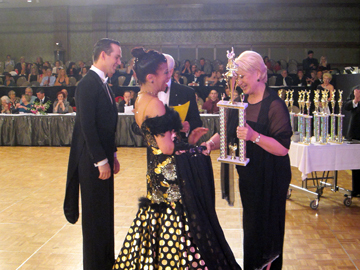 The Open B winner was Svetlana Van Tessel w/ Andrey Tarasov and she won all dances. 2nd fell to Kimberly Bolourtchi w/ Alex Borodko 5,2,3,3,2 and 3rd to Cindy Hwang w/ Nikolai Voronovich 3,3,2,4,3. 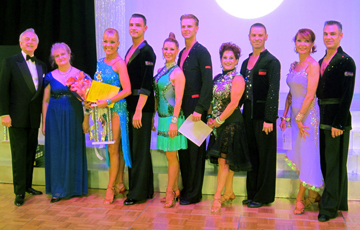 Connie Buckley w/ Leonid Proskurov won all dances in the Open C. 2nd in all was Rhonda Lynch w/ Stephen McCann and 3rd was Tammy Knight w/ Oleksil Lytvyn 3,3,3,4,3. Eugene Katsevman & Maria Manusova were on hand to perform their electrifying and fast-paced show that received several standing ovations from the appreciative audience. Not As You Might Expect! Friday night at CA Open Last night we saw the first of the Open Pro events and although one roughly as we expected, the other one did not. The surprise for us came in the Open Latin. Debuting tonight was former US Finalist, Yegor Novikov with new partner, Tetyana Olynyk. The question was, what would the judges decide. 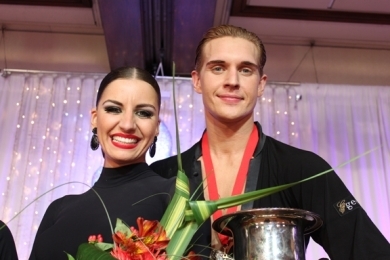 Well, there certainly wasn’t much doubt about the winners – Andrei Kazlouski & Asta Sigvaldadottir received the vast majority of the first places and easily won all dances. But it was not to be Yegor & Tetyana’s night to be second. While they did receive a number of 2nd placements in each dance, it was never enough and the majority of judges placed them lower. Finally their placements were 4,4,4,4,4 – obviously placing them 4th overall. Was this too low? You’ll have to read Dance Beat soon to find out what we thought and Martin Lamb will also give his thoughts on this division. But let’s not write off the other 5 couples in this great final. They were all great and it was a nightmare for the judges. The rapidly rising Vitalii Proskurin & Evgenia Shatilova took 2nd overall 2,3,3,2,2. We thought this was a close race with 3rd placed, Andrey Tarasov & Yulia Kuznetsova 3,2,2,3,3. Evgeniy Likachev & Mariya Levina took all the 5th placements, Oleg Astakhov & Olivia Wesolowska were 6th 6,6,7,7,6 and Simeon & Kora Stoynov closed the final, 7,7,6,6,7. As we said, the other pro event, the Open Smooth was a little more predictable. Nick Cheremukhin & Viktorija won all dances tonight. We did think the runners-up, Kris Suakjian & Brianna Haft put up a good fight and have improved in basic technique a lot, but they had to be content with 2nd in all dances. The closest race was for 3rd and that required a Rule 11 tiebreak that fell to David & Natalie Shulz 4,3,4,3 over Kyle & Allie Spinder 3,4,3,4. Sergiy Smolin & Anna Tomasini were 5th 6,5,5,5 and Alex & Jessi Allion were 6th 5,6,6,6. Beth Knoll will give her thoughts on this division in Dance Beat soon. The largest event of the night was the Amateur Ballroom, much swelled by the inclusion of many couples from BYU. 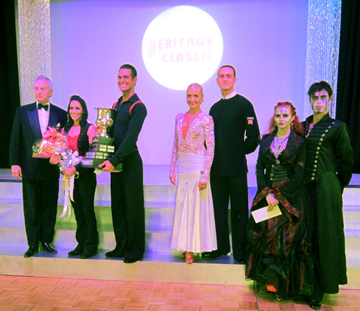 It was a strong final with the win going to the tall and stately Andrei & Veronika Ends – they won all dances. We really enjoyed the dancing of the runners-up, Ruslan Kalyuzhnyy & Ksenia Sovenko who were 2nd in 4 dances and tied 2nd in the quickstep. The other half of that tie was 3rd placed, Jordan Quintana & Grace Wang 3,3,3,3,2T – a fiery partnership that we also enjoyed. 4th in all were Tyler Wilson & Annie Seeley, 5th Dan Manea & Mia Hu (5,6,5,5,6), 6th Casey Treu & Kayci Kirkham (6,5,6,6,5). Big congratulations to Dmyt ry Dmytrenko & Cheyenne Murillo who won both the Under 21 and the Youth Latin divisions – both massive events. Of the Open Pro-Am Scholarships, danced in the late afternoon, the largest was the C and this went to Deborah Errico w/ Dariusz Michalski and she won all dances. 2nd went to Sally He w/ Enzo Zappia 2,2,3,2,2 and 3rd to Alex Hu w/ Olga Tsikalyuk 3,4,2,4,3T. 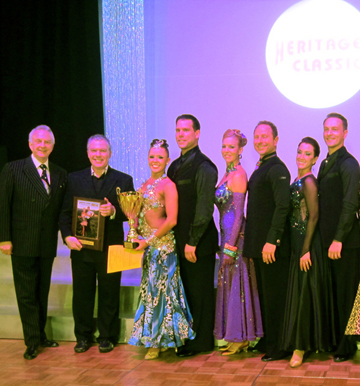 Melonie Krumer scored her second Open win of the weekend taking the Open A with Max Sinitsa and winning all dances. 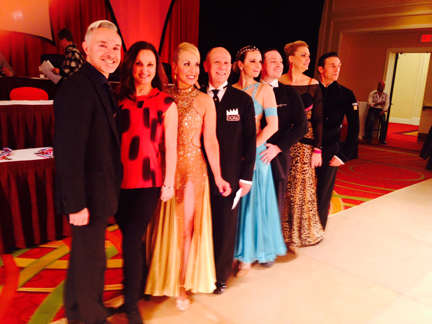 2nd was Rebecca Kuhn w/ Andrea Feraci, again in all dances and Machiko Fuji w/ Alex Muradasilov was 3rd. Alexandra Michel w/ Victor Veyrasset won the Open B, placing 1,2,1,2,1. It was a close race and taking 2nd was Lily Chang w/ Sergey Kiselev, 2,1,2,1,2T. 3rd went to Ling Ma w/ Edgar Gasjuns 3,3,3,3,2T. Stars Rising at CA Open The first of the professional events were held yesterday at CA Open – Rising Star divisions in Smooth, Ballroom and Latin. Kyle & Allie Spinder ran away with the Smooth taking all 9 first places from the judges in every dance. After them it was definitely tighter. Slava & Lara Kostianets, a tall, elegant couple from CA, new to us, took 2nd with 2,3,2,2. 3rd, but with the odd placements of 5,5,3,3 were Sergey Smolin & Anna Tomasini. We felt the Latin was perhaps the most exciting division of the night, with several truly rising stars contesting the final. The winners were Vitalii Proskurin & Evgenia Shatilova, but they did not have everything their own way. They placed 1,2,1,1,1 with Evgeny Likachev & Mariya Levina taking 2nd with 2,1,2,2,2. Vitalii & Evgenia’s best marked dance was the cha cha, where they took 6 of the 9 1st places. 3rd, placing 5,3,3,3,3 were Oleg Astakov & Olivia Wesolowska. The Ballroom was also quite a close race, but the win went to another new couple to us, Evgeniy Mayorov & Olga Lisovskaya from Nevada who won 4 dances and placed 2nd in quickstep. Taking quickstep were Simeon & Kora Stoynov. They were 2nd in the remaining dances. The judges were fairly evenly split between these 2 couples. Slava & Lora added a 3rd place here to the 2nd they received in the Smooth (3,3,3,3). The Pro-Ams competed in Rhythm today and many of the heats were highly contested. Unfortunately, the Open Scholarship did not attract huge numbers, but the quality of the dancing was high. The largest of the divisions was the Open C. Hope Huber w/ Troy Baeton won all dances and we thought definitely showed improvement in this style. 2nd went to Penelope Rostad w/ Nikolai Karchev (3,2,2,2,3) and 3rd to Philip Widlanski w/ Jolanta Mosteika (2,4,3,3,1). We were a little surprised to see Philip this low in the ranking. Natalie Crandall won the Open A (1,1,1,1,1). Nadiya Kireyko w/ Daniel Vasco was 2nd (2,2,2,2,2) and Tiffany Sulliva w/ Dustin Donelan was 3rd. Giovanni Fortezza w/ Jolanta Mosteika won the B taking all dances over Victoria Romm w/ Daniel Vasco. Darlene Bloom w/ Jason Daly was the winners of the Open Senior. 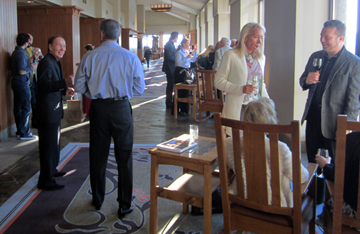 CA Open Starts Smoothly, despite winter storms! The CA Open started smoothly yesterday despite the winter storms that were disrupting travel nationwide. Even your intrepid reporter was delayed a day, due to airport closures. 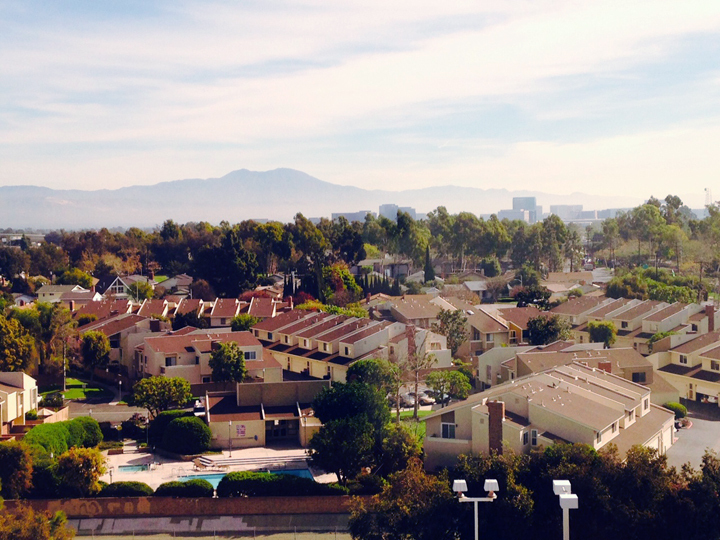 But it’s a balmy 80 here in Orange County! The CA Open is in a new home this year, the Costa Mesa Hilton, and so far everything seems great here. 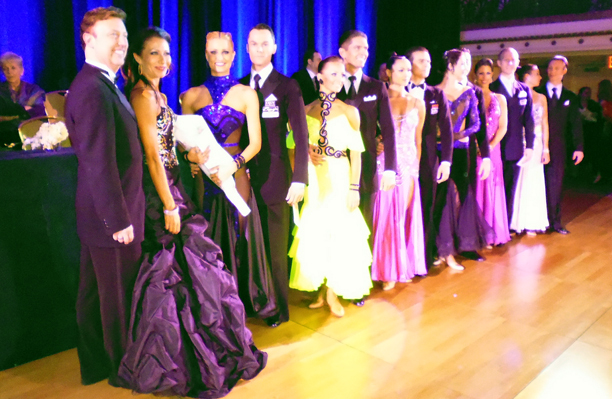 It was also a “smooth” day in the ballroom with the pro-ams completing all of their Smooth heats. We thought the best event of the day was the Open C smooth Scholarship that had three rounds. The winner was Hope Huber w/ Troy Baeton (1,2,1,1) who gave a very impressive performance. We were also very impressed with the runner-up, David Schmidt w/ Michelle Hudson (2,1,2,2). David actually came out on top in the Dancesport Series qualifier, but lost out on the money here. 3rd in all dances was another good competitor, Penelope Rostad w/ Nikolai Karchev. Penelope also won all dances in the Senior Open Smooth. 2nd in this was another good gentleman student, Norio Yamamoto w/ Anna Shabazyan (2,2,2,3). 3rd was Judy Brown w/ Marcin Tomaszzewski (3,3,3,2). The A & B Open Scholarships were both straight finals. Melonie Kumer w/ Max Sintisa won all dances in the A. 2nd in all was Irene Lee w/ Nick Cheremukhin and 3rd in all Kelly Morikawa w/ Jonathan Atkinson. Max Sinitsa’s student also won the Open B and this was Sirinda Sincharoen (1,1,1,1). 2nd was Karence Chan w/ Paul Cloud (2,3,2,2) and 3rd, Monica Broch w/ Kris Suakjian (3,2,3,3). Stay tuned for the Rhythm divisions tomorrow. Reverse Turn at Platinum! 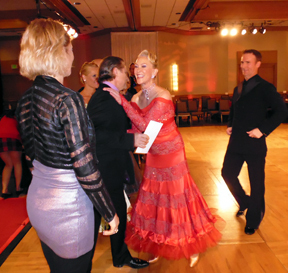 It was a reverse turn at Platinum Dancesport last night in the Pro Ballroom. Alexander Voskalchuk & Veronika Egorova were the clear winners taking almost all the judges’ first places. (Although they did receive one 4th place and two 3rd places from one judge). The reverse came in the 2nd and 3rd placements. Last week in Maryland, Gianni Caliandro & Arianna Esposito defeated fellow Italians Emanuele & Francesca Pappacena by 3 dances to 2. Here it was the reverse, with Emanuele & Francesca placing 2,2,2,3,3 over Gianni & Arianna, 3,3,3,2,2. Sergey Samchynskyy & Yuliya Besarab were 4th in all dances and Vladimir Triazin & Alicia Gruttadauria were 5th. It was a great beginning for Maksym Lototsky & Sarah Haworth who won all dances in the Rhythm on their first outing together. They won all dances, but had the majority of 1st places in only the cha cha and rumba. Overall the judges’ scores were quite divided in this event. 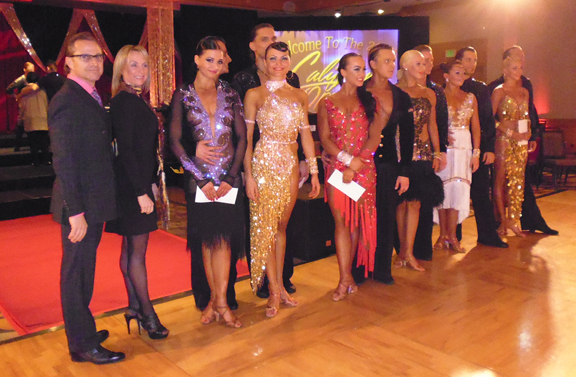 Another new partnership, Sandor Stefil & Aleksandra Barsukov were 2nd, 2,3,2,3,4. With 4,2,4,2,3, the experienced Stephen Smyth & Viktoriya Kleyman took 3rd. Tamas Kardos & Mariya Khristina Shurupova were 4th, 3,4,3,4,2; Romney Reyes & Brooke O’Donnell were 5th in all dances and Egor Shalvarov & Alla Profatilova were 6th. 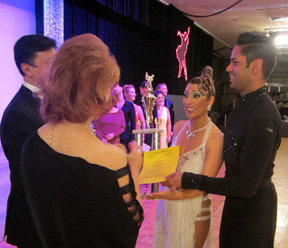 4 diverse couples contested the Showdance and the winners were Clifton Sepulveda & Mar Martinez performing to “At Last” in a classical style. The more whimsical James Brann & Sayra Vazquez took 2nd with a jazzy west coast swing. Carlos Zapata & Dora Yaneva were 3rd and Paolo & Liene DiLorenzo were 4th. The audience were thrilled with the closing show performed by Canadian Pro Latin Champions and World Finalists, Mauritzio Vescovo & Andra Vaidalaite. Next year Platinum is returning to its Downtown Miami home. Stay tuned to the Dance Beat Subscriber site for more about this year’s event. 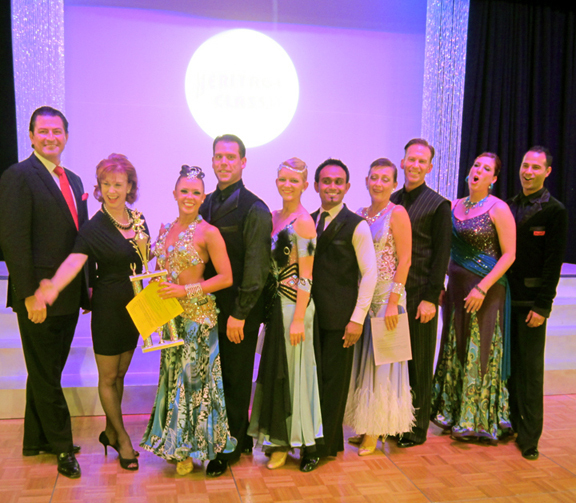 Pro Smooth Gives Surprise Ending at Platinum The Pro Smooth was the feature event of Friday at Platinum Dancesport and it yielded a surprise finish. Not too much surprise in the winners, however, as Mikhail & Galina Zharinov won all dances losing only 3 1st places out of 36. The surprise came with the ascendance of a new partnership, Chris Germain & Olga Chekhova to the runners-up position, besting the established partnership of Vlad & Vera Kosarev by 3 dances to 1. Vlad & Vera placed 2,3,3,3 to Chris & Olga’s 3,2,2,2. 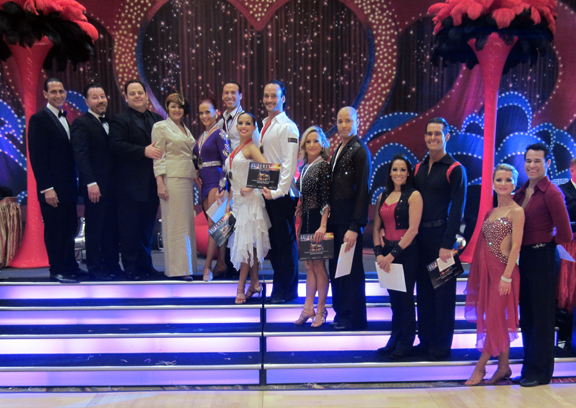 It was a split panel of judges between the 2 couples, but the majority favored the newbies in 3 dances. You’ll have to wait until the next edition of Dance Beat (or become a web subscriber) to hear our opinion. This event began with a semifinal. The remaining places in the final were: Stephen Smyth & Viktorija Kleyman (4,4,4,4); Egor Shalvarov & Alla Profatilova (5,5,5,5) and William Proper & Jennifer Caminas (6,6,6,6). It was also a pleasure to watch the children from the local studio, Dance Town, who performed most of the night in the various junior and youth divisions. For the pro-ams it was a full day of Rhythm and Ballroom, with some strong dancing especially in the Ballroom divisions. On the first night of Platinum (Thursday) it was all celebration as a cast of dance stars performed for the TAP Benefit Gala. Maryland ended yesterday nights with all the Open Pro divisions. Two of them provided interesting duels. 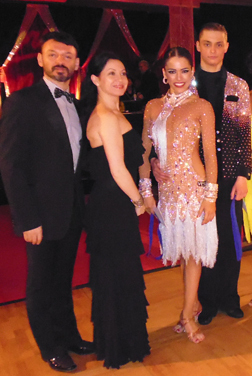 The first was the Ballroom that pitted two Italian imports against each other – Gianni Caliandro & Arianna Esposito and Emanuele & Francesca Pappacena. Today it was Gianni & Arianna who came out on top winning 3 of the dances. Emanuele & Francesca won waltz and quickstep. 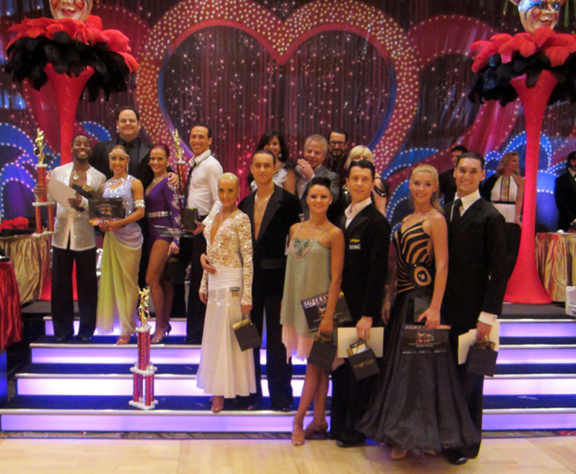 Each of the dances were won with the majority of 1st places. Both couples are free-moving and exciting and for us it was a close call. Find out more in the full article coming soon to Dance Beat. The remainder of the placements mirrored the Rising Star division. Oleksiy Buravenko & Victoria Karzukhina (3,3,3,3,3); She-Young & Adele Jang Don (4,4,4,4,4) and Janis Kukanis & Milda Gecaite (5,5,5,5,5). The second of the interesting divisions was the Rhythm. This was won by Andrei Svirydzenka & Yuliya Zubova 1,1,2,1,1. We thought they had a great night, showing great confidence and a lot of soul. They won their 4 dances with a slim majority of 1st places. 2nd and winning the swing, were Shane & Shannon Jensen (2,2,1,2,2). They offer a cleaner look than the winners, but for us didn’t really get into the mood tonight. 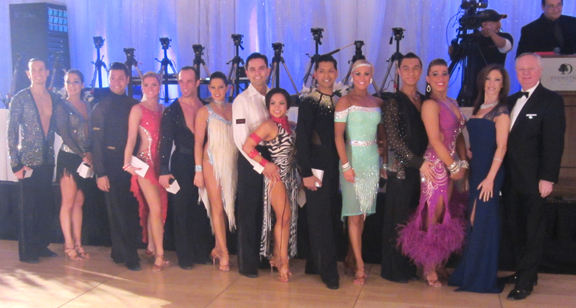 The remainder of the couples finished in the same position in all dances. 3rd, Stephen Smyth & Viktoriya Kleyman; 4th Romney Reyes & Brooke O’Donnell; 5th Jonathan Green & Carol Ann Miller; 6th Don Beedle & Jenn Christophel. The Latin also proved and interesting duel between two very different couples. The winners were the energetic and passionate Dmitry Nikishkin & Oleana Shvets. They won 4 of the dances, all with the majority of 1st places. 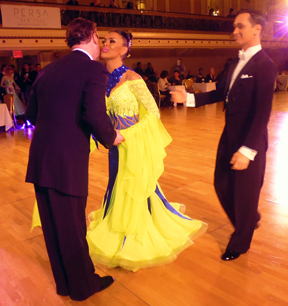 Winning the rumba and taking 2nd in the other 4 were the tall and elegant Rangel Spirov & Veronika Chernyavska. Very different to the winners both in appearance and style. 10-Dancers Sey-Young & Adele were 3rd in all dances. A new couple to us, Vladimir Velev & Lily Kolman were 4th in all. Zsolt Katona & Timea Potys were 5th (5,5,6,6,5) and Denis & Amanda Satonin were 6th. The most clear cut from the judges’ standpoint was the Smooth. This went to Kostadin Bidjourov & Erin Marie who easily won all dances. We also liked the strong movement from runners-up, Morten Jensen & Tonya Martin (3,3,3,3). 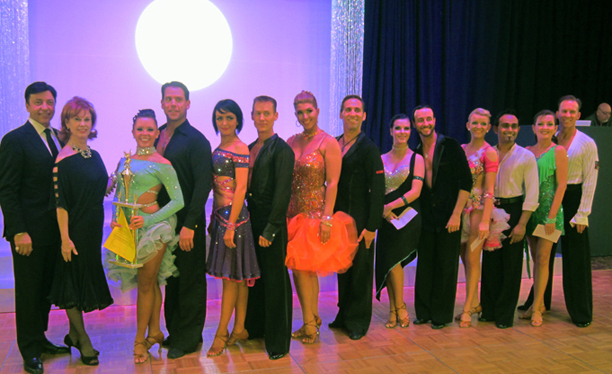 In 3rd place was a brand new partnership of two experienced dancers – Chris Germain & Olga Chekhova. We’re not sure if this was their first competition together, but there is certainly potential here. They were 3rd in all dances. 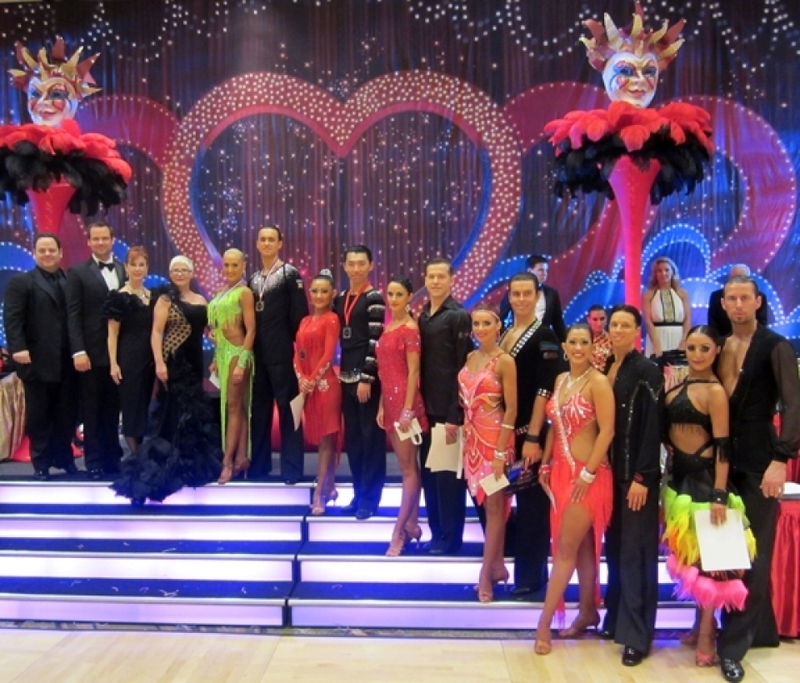 4th were 9-Dancers Stephen & Viktoriya (5,5,4,4) and 5th Serge & Yana Nelyubov (4,4,5,5). Jeffrey Golitiao & Katt were 6th. The evening ended with an entertaining pro show produced by JT Thomas. It had a Valentine’s theme and was entitled “Sweet Treats.” All the numbers had “candy” themed music. In a great “role reversal” it was the lady adjudicators who ended the show (lately it has always been the men). Rita Algarra, Polina Pilipenchuk, Amanda Reyzin and Lydia Petrigova strutted their stuff to the enjoyment of all. It was a really long day of pro-am dancing. All of the Ballroom and much of the Latin was held today including both sets of Open Scholarships. In both styles the B offered the best competition. 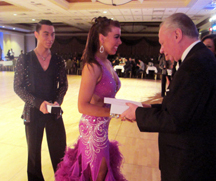 Yanina Kisler w/ Peter Walker comfortably won the Ballroom B, winning all dances. 2nd in all was Tomoko Shimizu w/ Emanuele Papacena and 3rd in all Kelley Weld w/ Slava Sergiev. The C fell to Krista Stewart w/ Igor Pilipechuk who also won all dances. 2nd went to Sue Gershowitz w/ Nikolai Pilipenchuk (2,2,2,2,3) and 3rd was Julia Wang w/ Peter Walker (4,3T,4,3,2). 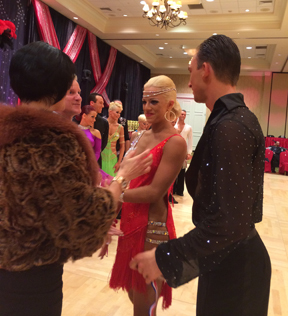 Jennifer Fales w/ Slava Sergiev won all dances in the A. 2nd went to Lisa Dodd w/ Garry Gekhman (2,2,2,2,3) and 3rd to Chris Nunes w/ Lisa Vegas (3,3,3,3,2). Missy White w/ Genya Bartashevich won all dances in the B Latin. 2nd went to Kelley Ward w/ Slava Sergiev (3,2,2,2,2) and 3rd to Erica Triscan w/ Sergey Izyumov (2,4T,4,4,3). Ann Morsili w/ Tibor Kerekes won the C, taking all dances. 2nd was Sue Gershowitz w/ Nikolai Pilipenchuk (2,3,2,2,2) and 3rd Laura Stolman w. Genya Bartashevitch (3,2,4,3,3). A good duel in the A resulted in a win for Sarah Gladish w/ Ilya Reyzin (1,1,1,2,1) over Joanna Wa w/ Anton Tregubov (2,2,1,2,2). 3rd was Lauren Lapointe w/ Louis Bar. Janice Stanton w/ Clive Phillips won the Best of the Best 10-Dance Challenge. Pro-Am Smooth Strong At Maryland! Yesterday the pro-am smooth topped the bill and the Open Scholarships were strong. After Thursday’s triple win for the men, Chris Nunes w/ Lisa Vegas kept up the tradition winning all dances to take the Open A. Nicole Vass w/ Scott Ruddick was 2nd 2,3,2,2 and Lauren LaPointe w/ Louis Bar took 3rd 3,2,3,3. Helena Kostik w/ Mazen Hamza took all dances in the B and showed a lot of improvement. Also challenging, we thought, was Chris w/ Lisa once again. He was 2nd in all dances. Anna Boyd with Kirill Gorjatsev was 3rd in all dances. Darla Davies w/ Jim Maranto was on form and won the C quite easily we thought and she did win all dances. Renee Kuwahara w/ Ilya Rezin was a strong 2nd in all dances. 3rd went to Amy Pollinger w/ Slava Sergiev, again in all dances. Darla w/ Jim also won the Best of the Best 9-Dance Challenge. The evening finished with two rising star events. The largest was the Rhythm. Shane & Shannon Jensen were the easy winners here, taking all dances. 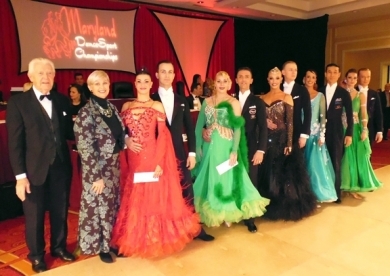 Also winning all dances in the Ballroom were Oleksiy Buravenko & Victoria Karzukhina. It was guys’ night out last night at Maryland Dancesport in the Open Rhythm Scholarships. Gentlemen students won all 3! Xavier Paol Aria w/ Mariangeles Moussou won all dances in the A, Giovanni Fortezza w/ Jolanta Mosteika won all danes in the B and Philip Widlanski w/ Jolanta Mosteika won the C 2,1,1,1T,1. We felt the C was actually the strongest division and this started with a semifinal. 2nd went to Darla Davies w/ Jim Maranto 1,2,2,1T,3 and 3rd to Renee Kuwahara w/ Ilya Reyzin 3,3,3,3,2. 2nd in all dances in the B was Angela Morisson w/ Peter Santiago and 3rd in all, Blaire Miller w/ Clive Phillips. Lauren LaPointe w/ Louis Bar was 2nd in the A, 2,3,2,2,2 and Nicole Vass w/ Scott Ruddick was 3rd, 3,2,3,3,3. There were 2 straight finals in professional rising star divisions. Sey-Young & Adele Jang Don won all dances in the Latin and Jeffrey Goltiao w/ Katt won all in the Smooth. 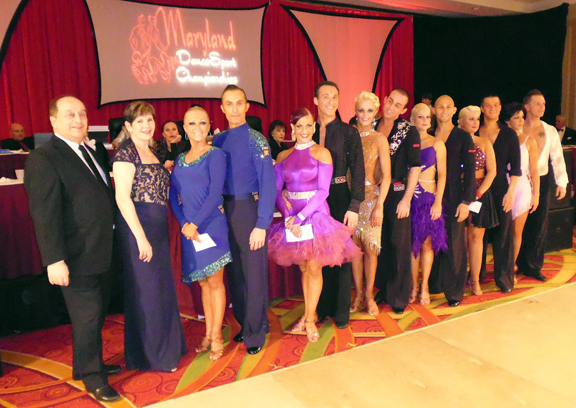 Joining the organizational team of Glenis Dee and Andrea Ringold this year here at Maryland Dancesport is Blake Kish. City Lights Concludes with Rhythm and Ballroom - Sunday The City Lights Ball in San Jose California concluded last night with a terrific Professional Ballroom competition and a fun Rhythm event. The Professional Ballroom had excellent couples in the field, Mikhail Avdeev & Olga Blinova won the event and all the dances but they were not the only ones to watch. Denis Kutepov & Lesya Sinitsa were also excellent and well deserving of the runners up spot, they placed second in every dance. 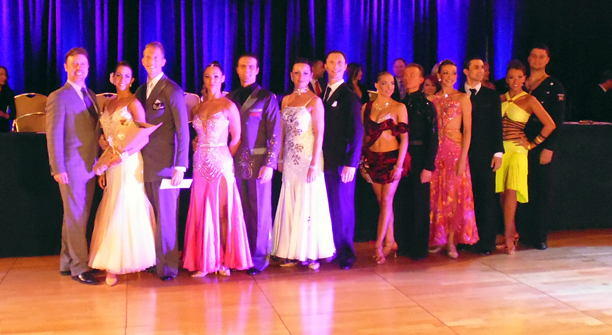 It was nice to see Rober Nemiro & Olga Tskalyuk back on the floor, they placed third overall (3,4,3,3,4) and Igor Colac & Roxane Milotti were a terrific addition as well with great energy and musicality, they placed fourth overall (4,3,4,4,3). Fifth in every dance went to Simeon & Kora Stoynov and sixth was awarded to Evgeniy Mayorov & Olga Lisovskaya. The Professional Rhythm competition had the most participants with a semifinal round and it too was very entertaining. Jonathan Chen & Nadine Messenger cemented a strong position in this style by taking first place in the open division as well as the Rising Stars, they won every dance. It most have been a disappointing finish for Slash Sharan & Meghan Anderson who we are sure wanted to take the first place finish home but like in the rising stars they placed second in every dance. Third place was awarded to Richard & Marianne Myers (3,3,4,4,3), I’m sure they were very disappointed with this placement, however, we too were disappointed with their performance and we will explain in the full City Lights article. Fourth were Alejandro & Lucelia Falcon (4,4T,3,3,5), fifth went to Tommy Belmontez & Jessica Holty (5,6,6,5,4) and sixth was awarded to Piero Della Santina & Alessandra Gonzalez (6,4T,5,6,6). Although the night before the ballroom was standing only perhaps due to the show by Arunas & Katusha and Giacomo & Melissa, for me the competition this night was terrific and very special. The ballroom was a little quiet as is customary from a Californian audience on a Sunday night, but, the finale to this City Lights Ball was excellent. My congratulations to the organizers in this their first City Lights Ball event, we wish you the best for years to come. New City Lights! - Saturday This was the first run for the new owners of the City Lights Ball, and as far as organization it all went without a hitch. Last night the professional events started and the two events ran were healthy finals with excellent dancing that kept the judges occupied. The most exciting of the two was the Professional Smooth. Here we had three excellent, seasoned couples fighting for first place, Kyle & Allie Spinder, Kris Suakjian & Brianna Haft and Nick Cheremukhin & Victorija. Our favorite was Kris and Brianna who looked completely prepared for this final, but that was not to be the winner in all dances was the new partnership of Nick & Victorija, who had very interesting choreography but who seemed to be going nowhere in our eyes (we will explain in our full article here soon). Third in this great event went to Kyle & Allie who took third in all dances. Fourth place was Nathan Simler & Mirelle Gineste –Tuendemann they placed fourth in every dance, fifth wen to Kyle & Christina Campbell (5,5,6,5T), sixth was awarded to Forrest Walsh & Alexandra Smirnova (6,6,5,5T), and seventh went to Piero Della Santina & Alessandra Gonzales who took seventh in every dance. The Professional Latin was as exciting but we felt that it was the most predictable. Unfortunately, we should give up predicting! Our winner, Denis Podolskiy & Yulia Kushnirenko placed third overall (3,2,3,3,3) even though we felt they had a wonderful night and we will explain why in the coming issue here also. The clear winner of this professional Latin event was Vitalii Proskurin & Evgenia Shatilova (1,1,1,2,1). 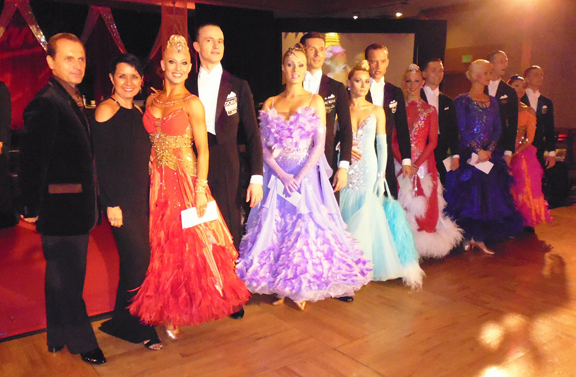 Second went to Andrey Tarasov & Yulia Kuznetsova (2,3,2,1,2). Simeon & Kora Stoynova placed 4th, Oleksii Lytvyn & Carly Booth were fifth, Artjom Shmigeljuk & Oceania Kashkina took all sixth and Lerey & Rebeca Bishop were seventh. The evening concluded with a professional show by Arunas Bezukas & Katusha Demidova as well as an intermission number by Melissa Dexter & Giacomo Steccaglia. So here comes another prediction! We think for a transition event everything is going superbly and we think that in the future we will probably have one of the best events in the USA here. As new kids on the block they have settled well on the job of running the event but I have the feeling that the “New” owners will come out with things to make it even more prestigious and special and to make it a “must” on your calendar next year.